IT’S THE “WHAT ABOUT WATERMELON” SEED SPITTIN’ CONTEST! - What About Watermelon? You are here: Home / General / IT’S THE “WHAT ABOUT WATERMELON” SEED SPITTIN’ CONTEST! 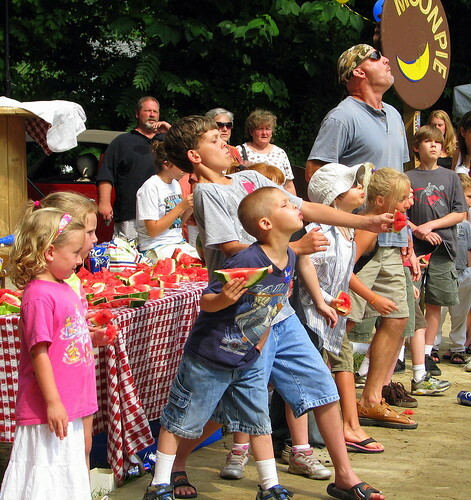 Watermelon seed spitting contests are held all over the world, but each year, at the Watermelon Thump festival in Luling, Texas, the best spitters in the nation come together for the World Championship Seed Spitting Contest. It’s a sight to behold, complete with TV cameras and a sizable crowd. In fact, they’ve even built their own seed “spitway,” complete with bleachers and a watermelon shaped spitting pad. It was in Luling that the current Guinness World Record for seed spitting was set at 68 feet 9 and 1/8 inches by Luling local Lee Wheelis in 1989. Lee’s record has stood for 20 years, and it got me thinking: What if we hosted a seed spittin’ contest right here on What About Watermelon? So that’s exactly what we’re going to do. Starting today, the inaugural “What About Watermelon Seed Spittin’ Contest” is officially underway. And yes, you have to drop the “g” in “spittin’.” The contest starts today and ends on Tuesday, September 29. The person with the longest distance will win a cool trophy and be forever immortalized in the What About Watermelon Seed Spittin’ Hall of Fame (it really is quite an honor). 1. Seeds can be spit indoors or outdoors. If spit outdoors, seeds cannot be aided by wind, and must be spit on a windless day. 2. Draw a line to serve as the launch point. You may get a running start if you wish, but when spitting, you cannot step over the line. 3. Distance shall be measured not from where the seed first lands, but from where the seed stops travelling. In other words, if the seed bounces or rolls an additional five feet, that extra distance counts. For this reason, you may choose to spit on a smooth surface, like a basketball court (indoors or out). 4. E-mail your best distance to me at watermelonexperts@gmail.com by Tuesday, September 29. Please use the honor system when reporting your results! Check here for some tips on how to spit seeds (try practicing with sunflower seeds). And, for a great glimpse of the seed spittin’ action and watermelon fanaticism at the Luling Watermelon Thump, check out ESPN.com reporter Darren Rovell’s coverage of the 52nd annual festival. Also look for an interview with a former seed spitting champion right here on What About Watermelon in the coming weeks. Good luck, happy spittin’, and let the games begin!! Oh, and below is an excerpt from The Tonight Show that ran just last week featuring Jimmy Fallon and some kids engaging in a watermelon seed spitting contest. Enjoy!